Kelly Lee Stinnett was born on February 14, 1970 in Lawton, Oklahoma. The five foot eleven right hand hitting Stinnett was a star baseball & football player in high school. He won the State Championship with team mates James Trapp and Will Shields who both went on to play in the NFL. Stinnett attended Seminole Junior College winning All American & Jr. College Player of the Year batting .399. He was signed as a catcher by the Cleveland Indians in the 11th round of the 1989 amateur draft. He was drafted away by the New York Mets in December 1993 in the Rule V draft. 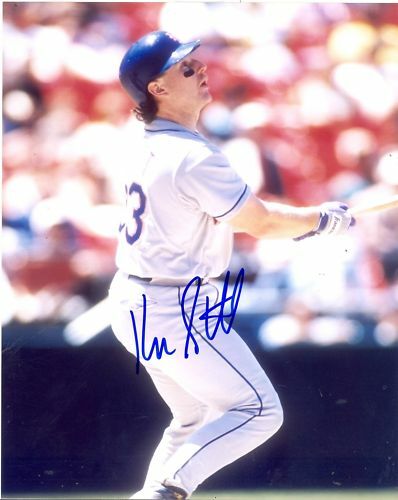 He made the club out of Spring Training & would spend two seasons in New York, as Todd Hundley’s backup catcher. He debuted in third game of the season at Wrigley Field, catching Pete Smith & hitting a double in the Mets 6-2 win. He would see action in 47 games for the Mets that year, making five errors behind the plate throwing out 32% of base stealers. 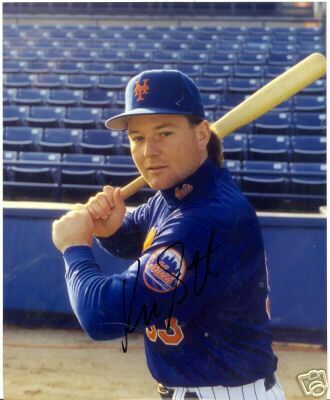 He would hit his first career HR on May 5th in St. Louis in the Mets 8-1 victory . On the season he batted .253 with 19 extra base hits 2 HRs & 14 RBIs. In 1994 his average would drop to .219 with 4 HRs & 18 RBIs playing in 77 games sharing time with Alberto Castillo as Todd Hundley’s back up. That off season he was traded to the Milwaukee Brewers for pitcher Corey Lidle who would go 7-2 for the 1997 Mets. Stinnett would play for 14 seasons as backup catcher in Milwaukee (1996-1997) Arizona (1998-2000) Cincinnati (2001-2003) Philadelphia (2003), Kansas City (2004) New York (A.L.-2006) St. Louis (2007) & another brief stint with the Mets in 2006 for seven games. He saw the most playing time in Arizona where he backed up Damian Miller appearing in over 75 games each season (1998-2000). In 1999 he had career highs with Arizona in HRs (14) RBIs (38) games (92). That year he played in his only post season series, the NLDS against his old Mets team mates. He went 2-14 with a run scored while playing in all four games. Stinnett was the catcher behind the plate calling the pitch Todd Pratt drilled for the walk off win in Game #4 in the bottom of the 9th inning. 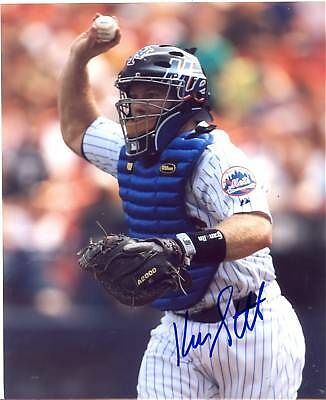 On August 24, 2006, Stinnett signed a minor league contract with the Mets. He made his return to Shea Stadium as a Met on September 9th, 2006 against the Los Angeles Dodgers, and went 1-3. He finished September with a .083 Batting Average, and was not included on the 2006 New York Mets postseason roster. After 14 seasons he batted .234 with 476 hits, 65 HRs 91 doubles & 230 RBIs playing in 734 games. In his career behind the plate he threw out 28 % of base runners, made 67 errors in 4063 chances (leading the league with 12 in 2001) posting a .9834 fielding %.